Documentation and Display: What’s the Difference? In this era of globalization, our ability to learn and function as part of diverse groups is essential to our capacity to survive and thrive. Yet almost all assessment and most aspects of instruction in schools still focus on promoting individual performance and achievement. In this course, you will investigate the power of the group as a learning environment, and documentation as a way to shape, extend, and make visible how and what we learn. The work of the schools in Reggio Emilia, Italy, has drawn international attention to children’s capacities as individual and group learners. 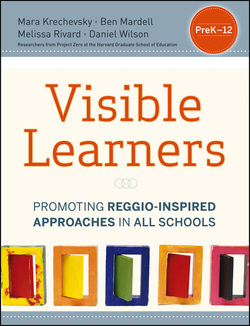 Based on a collaboration between Project Zero at Harvard, Reggio educators, and over 100 U.S. educators, the Making Learning Visible (MLV) framework extends key ingredients of the Reggio approach to primary and secondary schools and learners of all ages. Documenting children’s and adults’ learning challenges our assumptions about children’s capabilities and what thinking and learning look like. In this course, you will examine rich examples of individual and group learning in a variety of classrooms. Aided by extensive online and text-based resources, you will learn what the MLV framework is, why and when it is useful, and how to apply it in your own setting to benefit students, teachers, and your school community as a whole. Based on the Reggio Emilia approach to learning, Visible Learners highlights learning through interpreting objects and artifacts, group learning, and documentation to make students' learning evident to teachers. Visible classrooms are committed to five key principles: that learning is purposeful, social, emotional, empowering, and representational. The book includes visual essays, key practices, classroom and examples. Visible Learners asks that teachers look beyond surface-level to understand who students are, what they come to know, and how they come to know it. Supporting Learning in Groups in the Classroom includes practical tools with suggestions for creating learning groups at the beginning of the school year, forming study groups in classrooms, and promoting a culture of dialogue. provides tools for forming adult study groups, hands-on activities for adults to explore learning groups and documentation for themselves, and conversation structures for discussing and reflecting on student learning. Supporting Learning in Groups in the Staffroom provides tools for forming adult study groups, hands-on activities for adults to explore learning groups and documentation for themselves, and conversation structures for discussing and reflecting on student learning. Documenting Individual and Group Learning includes resources for understanding, creating, and sharing documentation with students and colleagues. Some tools will help you think through the purpose of your documentation; others provide guidelines for gathering or sharing documentation via video, computer, photographs, or powerpoint. Engaging Families in Supporting Student Learning offers resources to inform families about visible learning, involve families in supporting their children’s learning, and communicate with families about learning. Tools range from a refrigerator reminder to guidelines for parents interested in forming their own study group. Making Learning Visible beyond the Classroom provides tools and templates for creating bulletin boards, documentation panels, visual essays, and schoolwide exhibitions that make learning and learners visible, with examples from preschool-high school.